Thank you for your beautiful enthusiasm regarding the Women's Herbal Retreat that I shared with you this week. There is room available for seven more women, so if you haven't already done so reserve your space today. I can't wait to gather with you! On our return trip from Maine last October we made an unplanned stop in a state park in Indiana. It was a spontaneous overnight after I got worn out from driving a little camper through high winds all day. I decided it wasn't worth pushing on and we'd add one night to the journey. We pulled off of the interstate and found a campground. The first thing I noticed as we rolled through the park wasn't the beautiful rolling hills or the hiking trails or that we had the place to ourselves. What I noticed was the abundance of pokeweed. I had been wanting to dye with poke berries for some time but it doesn't grow in my region, so I was delighted to stumble upon it – and in full ripe fruit no less! As we were near the end of our trip I rationalized I could tuck bags of the poison (yes, poison) berries in the cooler and transfer them to the freezer when I got home. And since it's a toxic plant that the park was already trying to eradicate I didn't think the'd mind if I helped out a bit. We harvested berries and brought them home where I plucked the vibrant, juicy berries off of the stems and tucked a jar into the back of the freezer. And there they sat. For nearly a year while I awaited first my homegrown yarn, and then the courage to dye it. While the color is not what I was expecting (honestly, it never really is with plant dyes, except for predictable yellows) I am absolutely smitten with how it turned out. Along with black hollyhock it's my favorite color yet. And the many surprises that plants bring to the dye bath? That's just part if the fun for me. As for what I was expecting, I would say a bit less orange and a bit more red – In the pastel pink to deep magenta range. But truly, this color suits me even more than those. 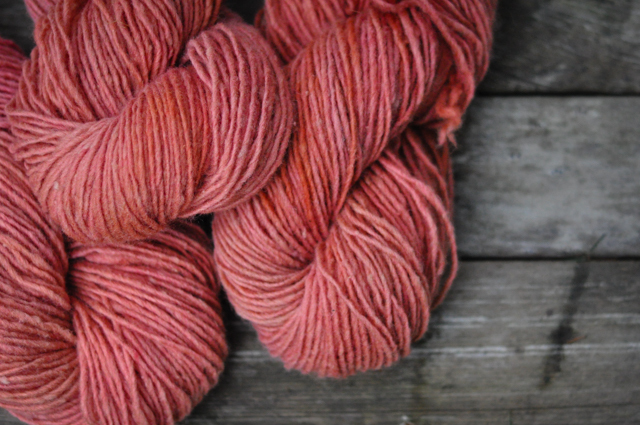 There's still quite a bit of color left in the dye pot so I'm contemplating adding another skein to see what results. Perhaps a more pastel melon color? Or maybe that pink I was expecting. P.S. If you are interested in exploring natural dyes yourself I'm quite taken by this book. Wow, that really turned out beautiful. What a good idea! This is an amazing color! Wow!